Food, Love, and Life: The Best Fries Ever! Cleveland, Ohio does have yummy food. Yes. You heard right. I actually said it. There's delicious, innovative, and unique restaurants springing up all over this city. It's the beginning of a growing culinary movement in the mid-West. Famous chefs (such as Michael Symon--Iron Chef on the Food Network) are migrating towards cities like Cleveland, Chicago, and St. Louis, opening 4 star restaurants. So enough background. Fries. Delicious ones. 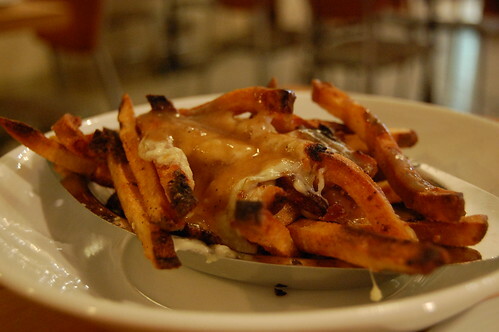 The Greenhouse Tavern in downtown Cleveland serves fries that are: seasoned with garlic and rosemary, deep fried in duck fat, covered in veal gravy, and topped with fresh mozzarella. Sounds like heaven, huh? These fries were even discussed on the Food Network show, The Best Thing I Ever Ate. So, check the show out (because it's great for finding restaurants in your area), try The Greenhouse Tavern, and eat something tasty wherever you may be.